Sudden Cardiac Arrest (SCA) is caused by something called ventricular fibrillation, this is an electrical malfunction of the heart, and this stops the blood pumping to the body and brain due to an abnormal heart rhythm known as arrhythmia. With cardiac arrests causing around 100,000 deaths in the UK a year it is no surprise that there is an increasing number of stories appearing in the press about people whose lives have been saved with the use of an Automated External Defibrillator (or AED for short) like the boy in Wigan who collapsed at the gym or the man who was rescued from certain death at the Sandringham estate. So how do defibrillators help? They work by delivering a small electrical current to the chest; this should shock the heart back into a normal rhythm and allowing it to pump again. Rapid response using an AED can also increase the quality of life for the survivor; this is because the longer the brain is starved of oxygen the more damage is caused, this can happen in a matter of minutes. With ambulance response times increasing it is becoming more and more necessary to have AED’s on hand especially in rural or hard to reach areas. And even general businesses, leisure centres, gyms and schools are all now investing in AED’s so they can be prepared for the unexpected. Most AEDs have a storage life of 5 years; they also perform their own maintenance check making these a great asset to any business for that extra added peace of mind. 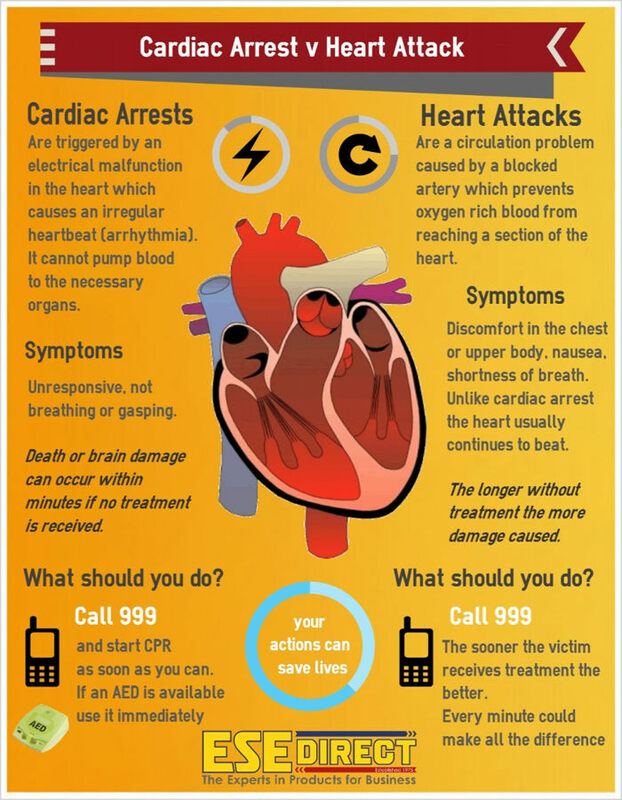 It is important to note that a defibrillator should only be used in the event of a cardiac arrest and not a heart attack, as most people confuse the two we have put together a handy infographic which explains the difference for you. If you are interested in buying a defibrillator, you can view our range of defibrillators online or speak to our award-winning and friendly customer service team who will be happy to help and answer any questions you may have.